A lot has happened in our household since I last hosted Fearless Family Travel. Grab a cuppa and let me enlighten those of you who haven’t been following the saga on Instagram stories. So, while getting through the short but chilly Portuguese winter, I’ve been looking forward to our trip to Ireland which was due to be followed four weeks later by our first family trip East. We were going to Thailand and stopping in Dubai on the way home for a few days. I was dreaming of a week on the beach, relaxing as a family, maybe visiting some islands, visiting temples and saying hi to Buddha like we did during our road trip in Central Portugal last year, before spending two days in Bangkok. All is not lost. Thanks to my awesome parents we're in the process of postponing our trip to Thailand and Dubai until the end of November. I've spent an hour on the phone with Emirates to change our flights and have sorted our accommodation changes. Now to satisfy Bangkok Airways and all will be good. It means we've got time for Mr Passports to recover and get back on his feet and take advantage of the boy not starting proper school this year. We've also given ourselves an extra day in Dubai as we realised there's loads to see and do there. We're hoping to visit some temples in Thailand and say hello to Buddha like we did at Buddha Eden during our Portugal road trip last summer. Fingers crossed we get to go this time! But, we’ve had to postpone that Easter trip until December because…..
My hubby only went and broke his leg in the first week of February, requiring surgery. He’s five weeks post-op and about to start physiotherapy to get him walking again. It’s been five very busy and tiring weeks, not only with looking after my hubby as well as the house, our son and dog, but we’ve also had a lot of running around to do and I’ve been trying to rearrange our flights and accommodation rather than cancelling our holiday all together. Thankfully we got our main flights changed, our internal Thailand flights reimbursed (and now I have to rebook them) and rearranged accommodation for our three stops. I’m just thankful that, despite our son being five already, he is not due to start formal schooling in Portugal until September 2020. So, we were in a position to decide to change it until the end of November. It means even longer to wait for this trip but it gives us something to look forward to before Christmas. Drama, hey! That said, my son and I enjoyed some time on the beach with friends who were visiting just after the accident. The seas was quite rough, despite it being a lovely day. I've been fairly quiet on my feed as we've had a bit of a disastrous time at home lately. If you haven't been following my stories, hubby broke his left leg last Thursday and is facing 4 months recovery at least. It means our big trip to Thailand and Dubai is off. Disappointed to say the least. Plus there's a possibility he's facing more surgery next year if the pins and plates need to come out. Another Easter trip looking unlikely (and it had the potential to be our biggest yet). We'll know more tomorrow hopefully….. I must admit I’ve been looking forward to Ireland and will update you on how the weekend went in my next round of hosting Fearless Family Travel. I still have a girls weekend away in London coming up in May to make up for the postponement of our Thailand trip. But at least we’re still going, albeit later than we had originally planned. I am so going to treat this boy to something nice when we're in Ireland later this week. He's endured two days of utter boredom with us. Yesterday we drove a 360km round trip to exchange our UK driving licences for Portuguese ones (thanks Brexit) and we had to take him with us as we weren't sure how long of a wait we'd have at IMT in Beja. Today, straight after school, we were at the hospital with Dad for a checkup and to get the physiotherapy plan for him. We'll get an appointment for the first one in the next few days. But he's slowly on the mend. Still a long way to go. Both times the boy was a trooper despite neither being very hospitable to a five-year old. Tomorrow he and I fly to Dublin for the weekend and while we're in the city centre he's going to be treated. It's only fair… Roll on Dublin! Anyway, enough about our family drama, let’s get going with this week’s Fearless Family Travel. We are so excited to partner with Lonely Planet Kids for the Fearless Family Travel linky. Each fortnight we will select ONE winner from all of those who have linked up with their family travel post. Link up your family travel post this week to be in with a chance of winning the Cardboard Box Creations. 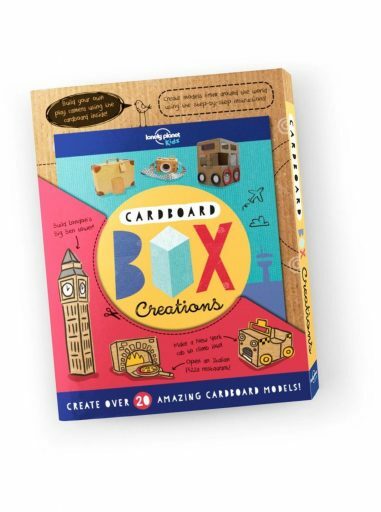 With this book you can get crafty by making cardboard creations from around the globe. From a Big Ben to a New York cab, this starter kit includes step-by-step instructions for creating your travel-inspired masterpiece and even comes with a starter kit of cardboard sheets with cut-out template guides. The winner will be announced on 1st April (no, we’re not fooling you), and please note that we can only post out the prize to those living in Europe. 101 Small Ways to Change the World is……. Happy Place Hunters. Congratulations! Please drop me an email to claim your prize. And a huge thank you to all of you who have been tagging your Instagram photos with #fearlessfamtrav. We are featuring them weekly on our instastories every Tuesday, so keep tagging. #fearlessfamtrav is the place to come and link up all your favourite family travel posts. From days out to holidays, city trips to beach breaks, top tips,a ccommodation and product reviews. If it’s about family travel, them we want to hear about it! Link up ONE post – old or new. We have a NEW BADGE! Copy and paste the html (below) to the bottom of your blog post, or if badges aren’t your thing, just link back to passportsandadventures.com. Please share the linky love and comment on the two host posts and at least two others! Please add the #fearlessfamtrav hashtag to all comments! Tweet your links @travelynnfamily @wandermustfam @goliveyoung @passportadvntr along with the #fearlessfamtrav hashtag and we will retweet to all our followers. Tag your Instagram pics with #fearlessfamtrav to be selected and featured in our weekly round-up of favourites over on our instastories. Please follow me on all my social media channels as I’ll be sharing the posts on there too (Facebook, Twitter, Instagram, Pinterest). Leona has a #fearlessfamtrav Pinterest group so drop her a message to be invited! The Fearless Family Travel with go live every fortnight on a Monday and will stay open for four days. The winning Lonely Planet Kids book can only be posted to those living in Europe. 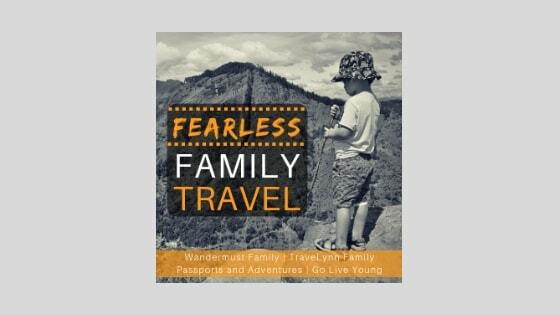 Remember that the next Fearless Family Travel will be hosted by Nicky at Go Live Young and will be live on 1st April. I can so relate to (and sympathise) with your husband’s broken leg and subsequent change in travel plans as I broke my ankle just before Christmas and had to cancel a trip too. I was so disappointed and mine was only a 3 day girls’ trip to Tallinn not a family holiday to Thailand. I hope physio is working and he’s mobile again. It’s a long road to full recovery I’m finding. Thanks for hosting the linky. Hope the leg is on the mend! And wooohoo stoked to see we won something, I’m not in UK though ( we’re in Australia) so guessing it’ll need to be regifted to someone closer?